216 articoli pubblicati con la parola (s) o la frase Timberland in Notizie, Tendenze, Video, Gallerie fotografiche, Agenda e ordinati per "data discendente". ...brands including US Polo Assn. Kids, Hugo Boss, DKNY, The Children’s Place, Flying Machine Boyzone, Little Mark Jacobs, Timberland and Billie Blush will sprinkle magic at Junior's Fashion Week. 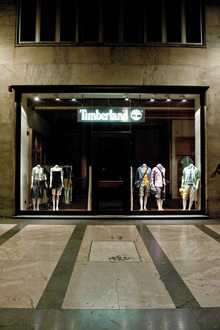 ...entering into an early renewal of their licensing agreement for the design, production and worldwide distribution of Timberland optical frames and sunglasses. ...people worldwide with operations across over 170 countries. Other subsidiaries of the company include Wrangler, Lee, Timberland and Vans.